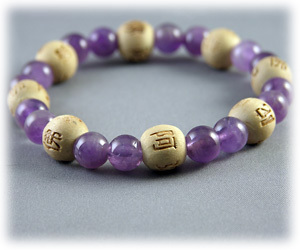 This beautiful bracelet was created from genuine Amethyst and Wooden Karma beads. Wear these bead always and you can have good health, be calm and tranquil, filled with peace and joy, free of stress and addiction, experience soothing, restful sleep, be open to new possibilities and new passions, enhance your creative abilities, and always discover the strength and beauty that lies within. Comes with an attached card with the above text.